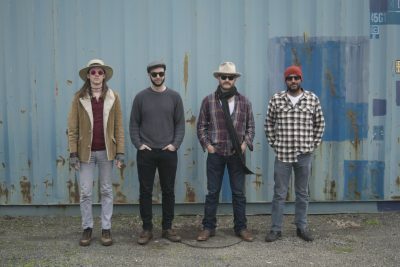 On April 21, The State Room will host one of the most epic concerts local music has to date: Ménage à Trois, showcasing Crook and the Bluff, Candy’s River House and PIG EON for a fully-orchestrated evening of the blues and psychedelic Western sounds. Crook and the Bluff’s Kirk Dath (vocals, guitar) and Darin Farnsworth (drums) give us a small snippet of the evening they have planned for Ménage à Trois. Farnsworth thought of the concept after a concert in Escalante, Utah. “We were just talking about how typical shows have flaws,” he says, “and I’ve had this idea of having a show where the music is just nonstop and how can we pull that off.” After months of planning and allowing the concept to take root, Crook and the Bluff were presented an opportunity to make this happen at The State Room. The song you’ll hear on the track is “Red” by Crook and the Bluff. Don’t miss Ménage à Trois on April 21 at 9 p.m. This show is 21-plus, and tickets are on sale online for $13 or $15 at the door. For more information, visit crookandthebluff.com.